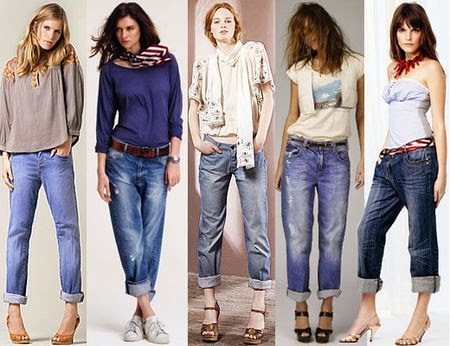 As most of people may have known that jeans is an item that never die in fashion. Today I want to talk about a kind of jeans that have been loved for a long time. I am so inspired by a blogger Chanel After Coco. I have been followed her blog since 2011. The very first thing I read was about boyfriend jeans. I always think that boyfriend jeans is for those who are in good shade coz if I am not, I am just look fatter and uglier in that jeans. I tried to go on diet for that but was never success. Anyway, I will talk about my recent diet plan next time. First of all, I've copy some pictures from Chanel after Coco. If you are interested in her blog, I highly recommend it. Click the name and you will find it. See! it can be very casual but also very trendy. I am sure no one will judge you if you wear that this summer. If it is still chill in your country, put on a blazer or leather jacket, you are good to go! crop tops have become my favorite item recently. Let's talk about it next time. Here is a picture I would love to share with you.